Wow this is cool! My FIRST review of something! Donna has a toy that she bought in the 1980â€™s (around the time my great-grandmother was born) called Da Bird. She took it out and played with us to see if we would like it. Hell yeah! David went out and bought a new one to see if they changed and allow us to review it. Man these things are great! Nova and I just cannot get enough play time with this toy! It is a pretty simple concept, a fiberglass pole with a string that has a feather bouquet at the end. The feathers are arranged so that if the human moves the pole around, the air movement makes the feathers spin and whir! When the feathers are doing this I can hardly contain myself or keep my eyes off them! The images to the left are of me and Nova jumping to catch Da Bird (Orion and Andromeda are in some of the images). If you look closely you can see it in the images. Da Bird comes in 2 flavors. The Original Da Bird has a single 36 inch pole and the new 2 part Da Bird has 2 (TWO) 18 inch poles that connect to make a 36 inch pole. Both offer great fun, trust me, but David likes the single pole a little better. Sometimes when I jump high and grab the feathers I can cause the 2 part pole to come apart. This does not happen often, but it can happen. David says that problem can be corrected by using a dab of glue to old the 2 pole ends in the connector sleeve. Of course then it will not come apart again either. The reason they make the 2 part pole version is for shipping and packing. Shipping a tube or box that is about 40 inches long to another country is just prohibitive and packing a 36 inch pole in your suitcase is next to impossible. So if you do not live in the USA or plan to pack Da Bird up and take it on trips, consider the 2 part version. Either way, your feline friends are going to love this toy and demand you have a play session every hour with them! Where to buy them is the next question. You can find them online if you search, or you can get them from the CoolCyberCats online store! Of course we are partial to our own store and hope that you help support us and our causes by buying Da Bird from us. We only sell items that we have tried, tested, like and approve of. Because of this our selection is not as wide as other online sites, but we also do not carry every product under the sun just to make a buck. 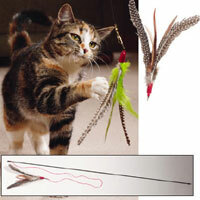 If we like the toy, more than likely your feline friend(s) will as well! Here is the link to our store: www.CoolCyberStore.com.